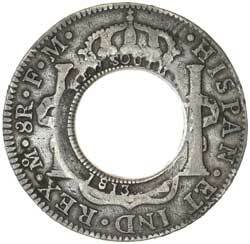 NEW SOUTH WALES, five shillings or holey dollar, 1813, a contemporary copy struck on a Charles IIII, Mexico City Mint eight reales, 1792FM (Mira-Noble cf1792/1). 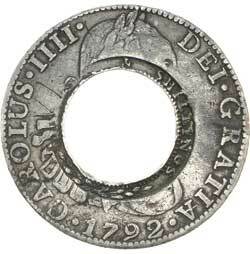 Evenly toned, very fine and extremely rare, one of the finest of its type and historically important. Ex D.Moorehead Collection, Spink Australia, Sale 29 (lot 3077), and Noble Numismatics, Sale 76 (lot 1219).